Building a Stronger Economy in 2017! 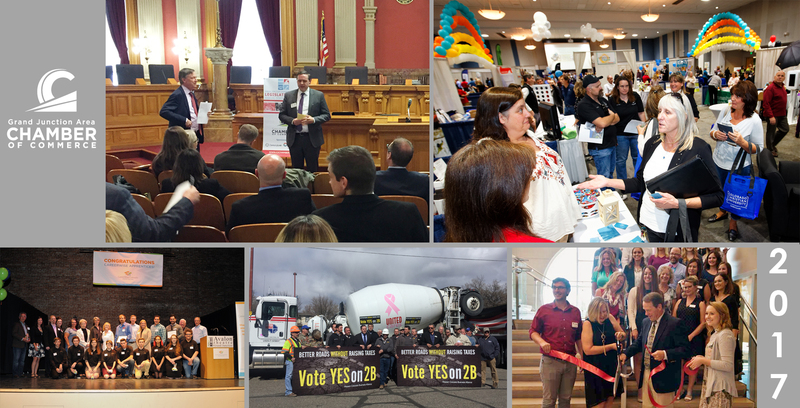 As the calendar and Chamber year come to a close in the next 30 days, it is time for a look back at how this Chamber advocated for business and a stronger local economy in 2017. Shown below are some of the notable accomplishments the organization was able to achieve with your help. Over 110 local businesses had direct contact from our business retention/expansion specialist with twelve of them receiving follow up assistance that led to the creation of over 250 jobs. Workforce Development efforts in collaboration with the Mesa County Workforce Center, School District 51 and Western Colorado Community College helped 40 unemployed young adults find business internships through Kick Start, eight individuals land apprenticeships with area industries through Job Connects, nine middle and high school students start their own businesses through the Young Entrepreneurs Academy and Mesa County gain accreditation by ACT as the first Workforce Ready Community in the state of Colorado. Building on the economic impact and workforce development impact of Colorado Mesa University, CMU 20000 was launched with a mission of growing the university student enrollment and community engagement. Over 500 community members have become CMU20000 supporters this year. As the voice of local business, the Chamber took positions on over 40 state and federal bills with an overall success rate of 64% on the state level. Additionally, the Chamber advocated for ballot issues to better fund K-12 education and public safety that all passed in 2017. Assistance for businesses in navigating the changing world of health insurance benefits was provided by a Health Care Summit, the first event aimed specifically at educating the business community on this complex topic. The Sunrise Seminars Series was launched to assist small businesses become more efficient and successful, joining a host of other programs and networking events already offered by the Chamber including Business Connects (with Mesa County Library), Tools for Business, Leads Groups, Business After Hours and Networking at Noon.